The District of Columbia, DC is located in the middle of the Atlantic coast of the United States, around the city of Washington (177 square kilometers). This area is usually called simply the District or DC, to avoid confusion with the state of Washington, located on the Pacific coast of the country. The most important centers of the country are concentrated here – political, financial, economic and cultural, there are offices of many international organizations, as well as numerous monuments and museums of national importance, which makes the county a popular tourist center of the United States. 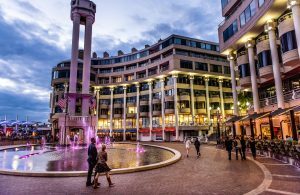 In Washington there is such an area that combines, so to speak, incongruous – this is a very solid, elite district of the city, distinguished by a measured, sedate way of life, but at the same time it is very “alive” and just teeming with young people. 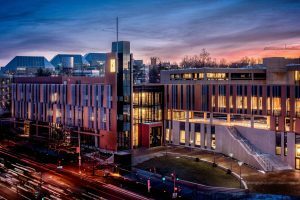 This is not surprising – in the heart of the district there is the University of Georgetown, which is considered one of the most prestigious educational institutions of the country. By the way, Bill Clinton studied there. This saturation gives Georgetown a special gloss, color and unique atmosphere. In this area, it’s not boring even to walk, admire architecture, views and take pictures of the most interesting sights. Closer to the evening the streets come to life and are filled with youth, laughter and merriment. Of the most interesting places that Georgetown has is the University building in the Gothic style. This is the stone mansion, which was built in 1765 and is considered the oldest building in Washington as well as the museum-estate of the Tudors. This house is known for the fact that the granddaughter of George Washington’s “father of the city” used to live there. Interesting: After sightseeing you can fully immerse yourself in the rich shopping world that Georgetown can offer. In Washington, there are a lot of monuments and memorials dedicated to the great worthy people of America. 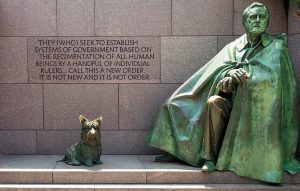 One of the most outstanding is the Franklin Delano Roosevelt Monument – this is the only President in the entire history of the United States, who led the country for four terms. The idea to perpetuate the memory of the 32nd President arose more than 50 years ago but officially the memorial was opened only in 1997 by Bill Clinton. Interesting: Every object, structure or monument has its own individual meaning. The entire memorial complex forms a play of four acts with a real prologue, epilogue and protagonists – the 32nd President of the States and American history. 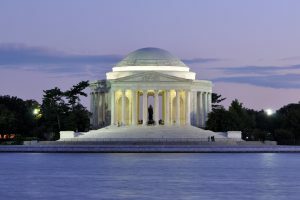 In honor of one of the most outstanding great political figures of the country, the founder of the American state, the author of the Declaration of Independence of the United States, the third President of the States and just a wonderful man – Thomas Jefferson – in 1943 the memorial with the same name was officially opened. In the center of the memorial stands the statue of the President in full growth. Around the memorial beautiful cherry trees grow – a gift of the authorities of the Japanese city of Tokyo, which during the flowering period together with the monument form an excellent scenic landscape. Interesting: Very entertaining fact: the original statue was made of gypsum because of insufficient funds, and only in 1947 the Jefferson Monument was replaced with a bronze one. 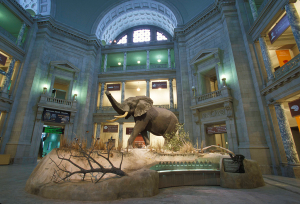 The National Museum of Natural History is located in the US capital, on the Main Alley of Washington and is included in the complex of the Smithsonian Institution. The collection of the museum began to gather as early as 1846 at the same time as the establishment of the institute, and the official opening was in March 1910. To date, the collections of the National Museum collected 126.5 million different artifacts. The most famous of them are a grandiose model of the African elephant and an amazing skeleton of the ancient Basilosaurus whale. The elephant from the moment of its appearance in the museum (1959) became its true symbol and the largest land mammal from the exhibits and artifacts. The skin of an elephant, weighing up to two tons, was donated to the Smithsonian Institution by Hungarian Josef F., who acquired it in the process of hunting Angola in 1955. The skeleton of the ancient whale Basilosaurus was exhibited in the museum’s exposition as early as the end of the 19th century. It is a unique specimen of the most accurate skeleton of such an incredible being. Interesting: Among other things, you can see magnificent collections of precious stones, minerals, insects, plants, fish and even photos. One of the most important and significant sights is the Ford Theater. The building of the theater was erected in 1861 and is located in the very center of the city. To reach it is not difficult from anywhere in Washington. Unfortunately, the Ford Theater has become famous all over the country and abroad not thanks to productions and talented actors. 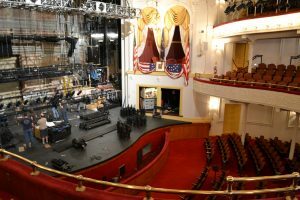 The theater owes its celebrity and world popularity to a tragic event – in 1865, during the performance of the play My American Cousin, Abraham Lincoln, who at that time was President of the United States, was killed. look at his personal belongings and items related to injury and death. The most interesting and valuable exhibits in the exposition are the “Derringer” of the 44th caliber, from which they shot a president and a knife wounded by a man sitting next to Lincoln. Across the street from the theater there is the Peterson House (a German tailor), in which the US president died. The most popular and visited place in the theater is the auditorium, where there is not a “happy” bed. On this seat no one else is sitting. Before the main tragic event at the Ford Theater, the history of the building developed quite successfully. A beautiful architectural monument of the first half of the 19th century served as a premise for a Baptist church. Already in the sixties, after the acquisition of the building by J. Ford, the theater began to gain popularity rapidly. was very modern and roomy for that period of time. The heyday of Melpomene’s church did not last long, because in 1865 the very event that glorified the building to the whole world happened. Since then, the theater building has become forbidden and unwanted, having undergone years of neglect and desolation. For some time its premises were a haven for the US military. The rooms of the former theater housed office and medical services. But the “military” period did not last long, after considerable destruction in the early 1890s, the building was completely abandoned by the people. For several decades it was not used and only survived by miracle and was not demolished. Interesting: Only in 1968, after 70 years of oblivion, life returned to the Ford Theater. The premises have been renovated and restored, and since then the theater and the Lincoln Memorial Museum have been housed here. The US National Zoo is located in Washington and is part of the Smithsonian Institution. Its formation began in 1887 with the aim of preserving the endangered fauna of the continent. It all started with a small piece of land, where several individuals of bison and other animals lived. 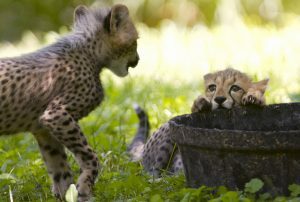 To date, the zoo covers an area of 66 hectares and contains more than 3600 individuals of various species, a third of these species are on the verge of extinction. The peculiarity of this zoo is the living conditions of fauna representatives – they are as close as possible to the real ones. On the territory of the zoo you can see bisons, zebras, elephants, cheetahs, giraffes, sloths, tigers, various kinds of birds, etc. In a separate room there is a large aquarium with sea anemones, crabs, octopuses, cuttlefish. And you can also see spiders, millipedes and beautiful butterflies. Interesting: Among other things, zoologists in the National Zoo are engaged in the cultivation and breeding of red wolves, golden lion tamarins and black-footed ferrets, which is very important for maintaining balance in the fauna of the United States. This memorial was inaugurated in 2004 and is the youngest among all the monuments located on the Main Alley. It is located practically between the Washington Memorial and the Lincoln Monument. The design and implementation of this monument is really great. Its construction lasted for quite a long time. 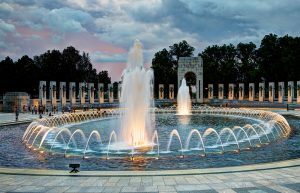 The memorial dedicated to World War II is a pond called “Rainbow” surrounded by 56 columns decorated with laurel wreaths that represent the unity of the states. A couple of arches on the sides of the reservoir symbolizes victories in the Pacific and Atlantic oceans. Interesting: On the Wall of Freedom individual stars are carved for each of those killed on the battlefield of World War II. Two magnificent fountains complete the memorial composition. amazing gargoyles and gardens that surround the temple. 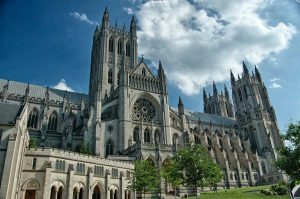 The Washington Catholic church was intended for mass worship associated with events of national importance. It was to become the property of the people and open to everyone, and not belong to any particular religious community. To date, this temple is the largest Catholic cathedral in the entire Western Hemisphere. Interesting: Today, the Washington National Temple is not only a beautiful landmark, but also the most important religious and social center of the country. Perhaps, one of the many reasons Washington, DC is worth visiting is the rich urban collection of national and private museums. Most of the exhibits and works of art can be found at the National Mall. After numerous excursions, tourists always want to relax and just take a walk through the streets of the city, and better – along the alleys of the park. However, you can combine business with pleasure and during the promenade to get acquainted with several other sights. not far from it there is the memorial building of Abram Lincoln with the great sculpture of the President inside. These two monuments testify to the strength of the spirit of American patriotism. Between these two places of interest there is the snow-white National World War II Memorial. Besides, in the park there are other memorial constructions – devoted to the veterans of the World War I, as well as battles in Korea and Vietnam. Here there are the memorials of the presidents Jefferson and Roosevelt, as well as Martin Luther King, a fighter for the rights of the coloured people. The latter is the most modern monument of all, located in the park – it was opened by Barack Obama in the summer of 2011. 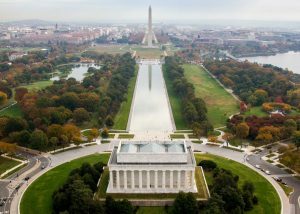 Interesting: Most of Washington’s museums are also located on the territory of the Mall, so this memorial park can be safely called a favorite place for tourists from all over the world.